Update: wap.sensis.com.au is giving me 403 (Forbidden) errors, however mobile.sensis.com.au seems to working with the same content. I’ve changed the urls in this article to the mobile… variant. Sensis is one of the many brands belonging to Australian fixed and mobile telecommunications and Internet giant Telstra (Wikipedia). 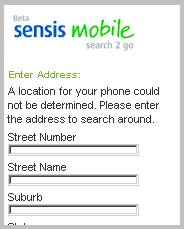 The Sensis brand is used for Yellow and White pages directories both online and mobile and for an online web search engine, www.sensis.com.au – “The search engine for Australians”. Sensis search’s default behavior is to return sites, products and services of interest to Australians. This is a subtle distinction from the Australian versions of Google and Yahoo which return global results by default with Australian only results being an option. 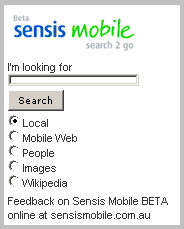 Sensis Mobile search (mobile.sensis.com.au) is in beta and offers local, mobile web, people, images and Wikipedia searches. The local and people searches are Australian Yellow and White page searches and are probably mainly of interest to Aussies. But I’m excited that the local search may be a true location based search (LBS) i.e., able to detect your phone’s location using either GPS or tower location. I’m basing that on the message I got when doing a local search, “A location for your phone could not be determined. Please enter the address to search around”. I’m in San Francisco and not a Testra subscriber so I wouldn’t expect them to be able to find my phone. LBS is pretty rare outside of Japan but is something I think has enormous potential. A major carrier like Testra implementing it may portend LBS roll-outs around the world. For non-Australians, the mobile web search is probably the most interesting Sensis feature. It uses FAST’s search engine. I’ve written about FAST, one of the pioneers of searching the mobile web. FAST developed and operated Alltheweb.com, a web search engine which at one time had a larger database than Google. In 2003, FAST sold Alltheweb to Overture which in turn was bought by Yahoo. From 2001 to 2003 FAST offered mobile.alltheweb.com which I always found vastly superior to Google’s mobile search in returning relevant results. Since 2003, FAST has sold a white label mobile search which is used by some mobile operators as the default search on their portals. Unless your operator is using FAST you haven’t find it on the mobile web lately. Telstra’s use of FAST give us a new opportunity to compare it with Yahoo and Google’s mobile search. Interestingly, Telstra doesn’t offer a transcoded web search like AOL, Windows Live, Yahoo or Google. Which is fine with me as I believe that true mobile web sites give a much better user experience than algorithmically mobilized PC sites. Like Sensis web search, the mobile version defaults to finding Australian results. The toggle for switching to global sites is on the results page – you have to see the Australian results first, select global and then re-search. Inconvenient, but I’m sure it’s a selling point when approaching Australian advertisers. I tried a few comparison searches between Yahoo, Google and Sensis mobile searches with the following results. A search for “euronews” on Sensis returned only one hit – an item in Digital Spy about a change in Euronews TV’s cable channel number. In comparison, Yahoo returned 850 results with Euronews’ mobile site being the first hit, Google found 1050 hits. A different Digitalspy story about Sweden’s TV4 acquiring a minority stake in Euronews was the first hit. The number two hit on Google was the Euronews i-mode homepage. 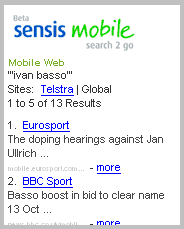 Sensis did better with the quoted name “Ivan Basso” returning 13 results all of which mentioned the Italian cyclist. Google found 852 mobile “Ivan Basso” pages while Yahoo surprisingly found none. As a test of the freshness of the search engine’s results, I searched for “mark foley scandal” without the quotes. Sensis did well on this one returning 263 hits with every one of the first 40 referring to the week old news of the Republican congressman being forced to resign after admitting to sending inappropriate messages to House pages. Yahoo only found 11 results and only the first two were related to the congressman. Google did the best with 1180 hits. I stopped checking after the the first 100 but all of those were about that Mark Foley’s recent troubles. I think it’s clear that Google has long since erased any advantage that FAST once had in mobile search. Still it’s good to have a public url for FAST mobile search again. Sensis gives me a third search engine to try when I draw a blank on Google and Yahoo. The Sensis image search is OK but nothing special. Results are presented as thumbnails which are 128px on the longest side. Clicking a link will load the image in it’s original size which in some cases will be too large to view on a mobile browser. Sensis’ Wikipedia search was suffering from beta woes when I tried it, I could see a list of articles matching my query but the site timed out when I tried to bring up the actual Wikipedia item. I’ve added Sensis to Yeswap.com under Search/Web-Wap Search.